Below is a list of all the gear I use for my tutorials and for my freelance videography and editing gigs. If you have any questions about my gear you can go to my contact page. You can also check out my recommended video kits at my kit.com page. The Canon EOS M3 Mirrrorless camera is a perfect budget vlogging and travel camera. The LCD touchscreen flips up so you can see yourself in a selfie-style, if you need it. It shoots 1080p HD at 24/25/30 fps and RAW images with an ISO 100-12800. It has a 3.5 mm Stereo Mic input for Lav or Shot-Gun microphones. You can buy an M-EF lens mount adapter to use EF-mount lenses with this camera. This 30.4MP Full-Frame CMOS sensor camera has excellent dynamic range and it shoots both 1080 HD or 4K video resolution with Canon Log enabled. If you like shooting with DSLRs, this camera is so intuitive and easy to use for on-location video and photo shoots. Perfect for filming events. It has a dual CF (CompactFlash) Card slot system and a dual XLR input. It records 1080 HD, 60p/60i, 30p, or 24p fps. This 0-100% dimmable on-camera light is perfect for replicating day-light in tight on-the-go film shoots. Great for illuminating your subjects face in dark rooms. Excellent shot-gun microphone for DSLR or mirrorless cameras. It has a direct 3.5mm stereo input and a rycote lyre shockmount. It is rechargeable via micro-usb. This is a great backup mic which requires no batteries, only a 2.5V camera plug-in power (3.5mm). The supercardioid pattern picks up sound in a tight area of the front of the mic, so if your subject moves around while they speak the sound levels will fluctuate. Do you need to mount two on-camera lights and a shotgun mic on your camera? This is the perfect rig for you! With a minimalist design, this is the sturdiest and cheapest tripod on the market for a mobile video producer. It supports up to 8.8 lbs. Perfect for recording a separate audio channel from your camera. You can hook up a shotgun or a lav mic system to the H4n to record and monitor audio to an SD card. It also has it's own built in mic as a backup. This computer changed my life. I can edit so fast and export speeds are amazing. We're taking 1 min exports for a 3 minute videos. I chose 32GB RAM, D700 GPU and 512 GB of internal hard drive space. This light is portable, bi-color (orange to daylight), and it includes a light stand and carrying case. It can be powered through AC power or through battery, but you need to buy the v-mount battery separately. The battery is $199, but it lasts 5.5 hours. The perfect kit of lighting interviews and Youtube videos. It comes with one Rifa eX 44 softbox lamp, 1 pro-light with a 4-way barn-door set for shaping light, and two 7.9' lighting stands + carrying bag. 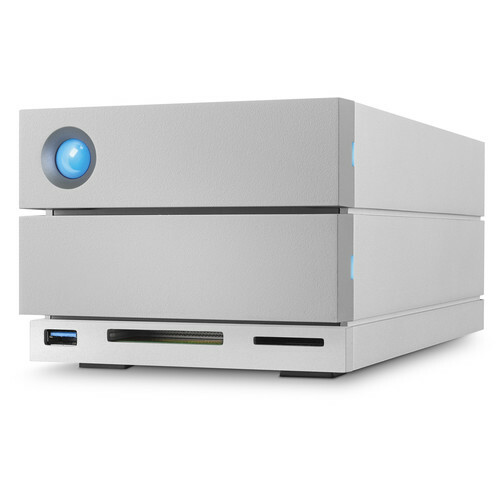 Includes two 10TB hard-drive which can support RAID 0, 1 and JBOD. It features a CompactFlash & SD card slots for an easy way to import video and photos to your computer. This is a perfect hard-drive for a mobile video editor and producer because it is dust and water resistant. It has a connected, built-in, thunderbolt cord and an optional USB 3.0 interface and cable. It supports RAID 0 and 1. It is Window and Mac compatiable. Fantastic keyboard to help video editors edit faster with shortcut reference and backlit for darker editing suites. Perfect for sharing footage on small teams. It also includes a media management software called "Sharebrowser," where you can tag, add comments and send footage directly to Adobe Premiere Pro. Excellent mobile live-stream kit where you can use your iPhone as video recording and streaming device. It includes two lenses, one wide-angle and one telephoto lens you can attach to the iPhone case. There are other types of cases if you have a different version of the iPhone or even an iPad. Check them out here. Holds a DSLR camera, two lenses, flash, batteries and other lens accessories. I love this backpack! It's sleek, waterproof design, can fit a small compact tripod, DSLR camera, 15" laptop, batteries, shotgun microphone and more.